North Korea’s version of MI6 managed to infiltrate two United Nations agencies with a father-and-son team of spies. The World Food Programme (WFP) confirmed that Kim Su Gwang, 38, is no longer in his position at its headquarters in Rome. Mr Kim was one of two UN employees named as North Korean intelligence officers. The other was his father, Kim Yong Nam, 67, who worked in Paris on a contract for the UN Educational, Scientific and Cultural Organisation (UNESCO). The exposure of the father-and-son team lifted the veil on North Korea’s efforts to infiltrate international organizations. The two Kims were both named as members of the Reconnaissance General Bureau (RGB), the North Korean intelligence agency charged with conducting clandestine operations abroad, one of North Korea’s four intelligence services. The WFP still has a presence inside North Korea. Mr Smerdon said the agency was helping 1.1 million women and children across the country who “suffer from chronic malnutrition due to a diet lacking in key micro-nutrients”. A South Korean Foreign Ministry official said Tuesday that North Korea would dispatch its top diplomat to a high-level U.N. human rights meeting next week, in an apparent attempt to counter international criticism of the country’s human rights record. The South Korean official, who asked not to be identified, told the VOA Korean service that North Korean Foreign Minister Ri Su Yong was expected to speak at the meeting of the U.N. Human Rights Council, which will convene March 2 in Geneva. Ri would be the first North Korean foreign minister to address the council. Recently, Pyongyang launched an aggressive campaign to cope with mounting international pressure over its treatment of its citizens. The call for improving human rights conditions in the communist country was prompted by a damning report by the U.N. Commission of Inquiry (COI), which accused North Korea of committing crimes again humanity. Some analysts in Seoul say Pyongyang is likely to attempt to discredit the report and accuse Seoul of abusing human rights by attacking South Korea’s National Security Law. That 1948 law bans praise or support for North Korea. International human rights groups often have accused the South Korean government of using the law to suppress freedom of expression. “They will repeat the regime’s argument that the COI report is based on fabricated information and will likely say the South Korean government is infringing upon its citizens’ human rights with the implementation of the National Security Law,” said Kim Soo-am, a North Korea expert at the Korean Institute for National Unification, South Korea’s state-run research institute. Rarely does a United Nations investigation produce such clarity and impact as did the Commission of Inquiry on human rights violations in North Korea. The report, issued a year ago, documented the existence of political concentration camps in the Democratic People’s Republic of Korea and a regime that has treated its people with sickening brutality. But now what? What can be done to get concrete help for the victims? There is a danger that as other pressing concerns about North Korea accumulate — nuclear weapons, missiles, cyberattacks — the world will lose interest in the human rights disaster. One of the most prominent witnesses to the depravity of the North, Shin Dong-hyuk, recently changed some elements in his account. The changes do not undermine the larger conclusions of the U.N. commission, which received public testimony from some 80 witnesses. The U.N. commission, chaired by Michael Kirby, a former justice of the High Court of Australia, found that North Korea’s leaders should be held accountable for the abuses and recommended referral to the International Criminal Court for investigation of crimes against humanity. However, veto threats by Russia or China are real, and a referral is not going to happen, at least not now. Much work remains to be done. A key step is to provide adequate financial resources for the U.N. office of the special rapporteur for human rights in North Korea, Indonesian lawyer Marzuki Darusman. 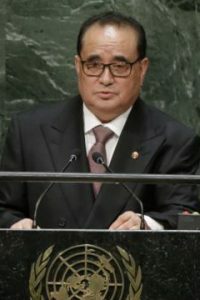 A related and significant initiative, just starting, is the establishment of an office by the United Nations in South Korea that will continue to investigate human rights abuses in North Korea, with an eye toward identifying who in the regime’s leadership is responsible for the horrors so that they can eventually be held to account — and so that current officials may think twice before becoming complicit in an ongoing crime against humanity. 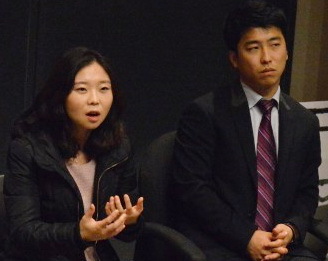 Three North Korean defectors spoke Monday about their escape from the socialist country and their transition into their new lives at a panel hosted by Boston University’s Liberty in North Korea (LiNK) student group. North Korean leader Kim Jong Un has signaled he may further purge top cadres, ordering senior Workers’ Party members to carry out a “campaign against abuse of power, bureaucrat-ism, irregularities and corruption”. The party adopted the resolution at a politburo meeting to review his three years in power, the official Korean Central News Agency reported on Thursday. The warning comes after Kim unleashed a series of purges to tighten his grip on power in the reclusive nation. The “Supreme Leader” last month executed a general who disagreed with him. Kim ordered the killing of his uncle and one-time deputy Jang Song Thaek in 2013, after accusations of graft and factionalism, and had about 50 officials executed last year on charges ranging from graft to watching South Korean soap operas. Since North Korea’s founding in 1948, Kim, his father, and his grandfather have eliminated people perceived as a threat to their dynastic rule and personal power. Charges have ranged from spying for the United States to gossiping about a leader’s mistress. Kim, believed to be about 30, controls North Korea’s 1.2 million troops and nuclear arms program, having taken over the nation of 24 million people after Kim Jong Il died in December 2011. Ambassador Robert King, Special Envoy for North Korean Human Rights Issues, will travel to Indonesia February 23-27 for meetings with senior officials to discuss the deplorable human rights situation in North Korea. Ambassador King will meet with senior Indonesian government officials at the Ministry of Foreign Affairs, members of the People’s Representative Council, and civil society members. This visit underscores the U.S. commitment to work closely with the international community to sustain international attention on the deplorable human rights situation in North Korea. Around the globe, tens of thousands of North Koreans work long hours for little or no pay, toiling in Chinese factories or Russian logging camps, digging military tunnels in Myanmar, building monuments for African dictators, or sweating at construction sites in the Middle East and aboard fishing boats off Fiji, according to former workers and human rights researchers. For decades, North Korea has been accused of sending contract workers abroad and confiscating most of their wages to support its leadership. But in the years since Kim Jong-un took over as leader, human rights researchers say, the program has expanded rapidly as international sanctions have squeezed the country’s other sources of badly needed foreign currency, like illicit trading in missile parts. A 2012 study by the North Korea Strategy Center, a defector group in Seoul, and the private Korea Policy Research Center estimated that 60,000 to 65,000 North Koreans were working in over 40 countries worldwide, providing the state with $150 million to $230 million a year. That number has since grown to 100,000, human rights researchers said. NK Watch has collected the testimony of 13 former North Korean contract workers, now living in South Korea, in support of a petition to the United Nations asking for an investigation into what it calls “state-sponsored slavery.” The petition, to be filed next month to the United Nations’ special rapporteur on contemporary slavery, said the migrants worked a minimum of 12 hours a day, were given a full day off only a few times a year, and received only a small portion, commonly 10 percent, of their promised pay, or none at all. One worker told NK Watch that he received only $160 in the three years he worked in a Siberian logging camp in the 1990s, toiling up to 21 hours a day in temperatures often below minus 20 degrees Fahrenheit. He was told the rest of his wages were sent home to his family. But families were given only coupons for state-owned stores, which often had nothing to buy, former workers said. And while 25,000 North Koreans have escaped to South Korea, and perhaps 200,000 North Koreans are in hiding in China, some 25 million North Koreans continue to suffer in silence, unable to communicate to the outside world because of their enslavement at the hands of their government. To mark the one-year anniversary of the U.N. report – which, sadly, has yet to have a discernable effect on life in North Korea – the Robert F. Kennedy Center for Justice and Human Rights, in Washington, D.C., convened a panel discussion with three defectors. The tales that the three former North Koreans – Hyun-ah Ji, Praise Joo, and Johan Kim – told were predictably grim, involving torture, hunger, and fierce repression. But the panelists also struck a positive tone, noting that the world is paying attention to North Korea’s abuses (they have been traveling the States for weeks, telling their stories), and trumpeting the success of initiatives like balloon launches into North Korea (which one panelist said the North Korean regime hates the most), and broadcasting free media into the country. That these courageous refugees are devoting their life to talking about North Korea shows, in a tragic way, that they are in some sense still psychological prisoners of the regime – they cannot escape. But the world — and their fellow countrymen — benefit from their bravery. For these defectors speak for the 25 million North Koreans who cannot. Commemorating the one-year anniversary of the report by United Nations Commission of Inquiry on human rights in the Democratic People’s Republic of Korea, an unprecedented gathering of policy makers, opinion leaders, and stakeholders on the topic of North Korean human rights took place on February 17th. The gathering aims to carry forward the momentum created by the United Nations Commission of Inquiry report and subsequent UN action. North Korea is highly patriarchal. … In the past, women faced criticism if their husbands were seen in the kitchen, though things might have gotten slightly better these days. Women, and not men, are expected to take care of everything that happens within the house. No matter how hard it is to make a living, the only duty men are expected to perform at home is to ban family members from doing anything against the policies of the Workers’ Party of Korea (WPK). In other words, it is thought that the role of men is to teach their wives and children so that they will not do anything that interferes with party ideology, even if they’re on the verge of starving to death. This is often reflected in divorce cases. If a husband or wife does anything contrary to party ideology, even to make a living, this is considered grounds for divorce.And if husbands are violent towards their wives the government doesn’t interfere, leaving women to bear the consequences alone. In my hometown, I’d say domestic violence occurred on a daily basis in three out of 10 households, and less often in others. North Korea was officially pushing for and encouraging gender equality before South Korea, but this wasn’t for the good of women. When China and North Korea officially campaigned for gender equality, it wasn’t done to free women from the patriarchy: the motive was to encourage women to go to work to re-build the economy after the Korean War. Actually, women played a large role in this rebuilding. The government bestowed awards for working women who achieved great things, labeling them “hard-working heroines” to encourage more women to work harder. But when things got better in the 1950s and 60s, when the North Korean economy was outperforming that of South Korea, they didn’t need the women’s labor force anymore, so they stopped encouraging women in the workplace. Gender equality and women’s role in society were considered important when women were needed but not when the need passed. In North Korean society, when women do a good job at cooking, cleaning and other housework or when they bring home money from selling goods at the market they are highly praised.